When we think of posture, we tend to correlate it with our waking life, but we forget that each night we spend a full work day of time in some type of posture whether it is good or bad. When we wake in pain, with an arm asleep, or have a “crick” in the neck, you must consider your sleep posture to be a potential contributing factor. We must premise this topic by mentioning that many variables go into what is the best sleep position for you, so some positions may work better for some depending on the their circumstances. 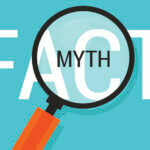 Sleep is extremely important for our body’s health and recovery. 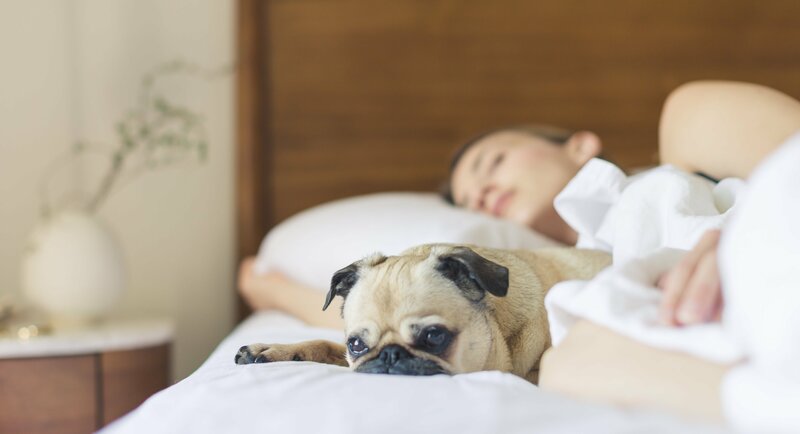 Since it is not something often discussed, we would like to provide some recommendations to help you keep your body better aligned at night, improve your breathing, and reduce the stresses on the joints. Some sleep positions are better for certain conditions, so you should consider whether you snore, have shortness of breath, sleep apnea, neck pain, back pain, or shoulder pain when choosing your sleep position. 41% of the population choose to sleep in the fetal position on the side. The fetal position is a very healthy option that corresponds to the position we all once performed in the womb. 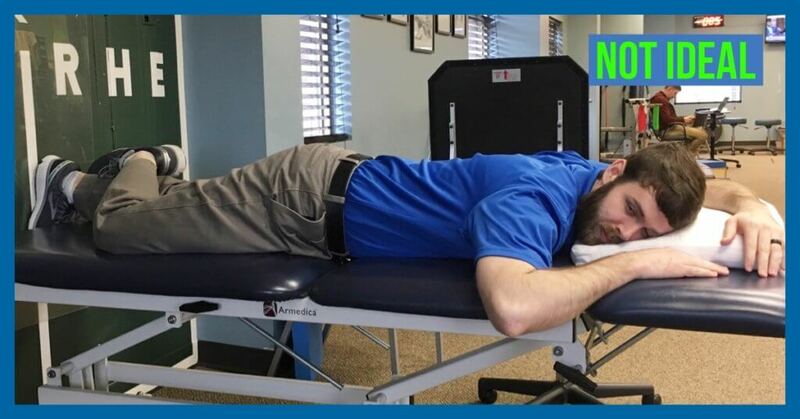 Being in a flexed position allows your spine to rest in a decompressed state and prevents snoring, acid reflux, and sleep apnea. This is also the best position to choose if you are pregnant, specifically the left side, because it will keep your uterus from pressing on your liver and will facilitate circulation to your fetus. To prevent this position from restricting your breathing or aggravating arthritis, do not curl up into a tight ball but rather stretch out some. 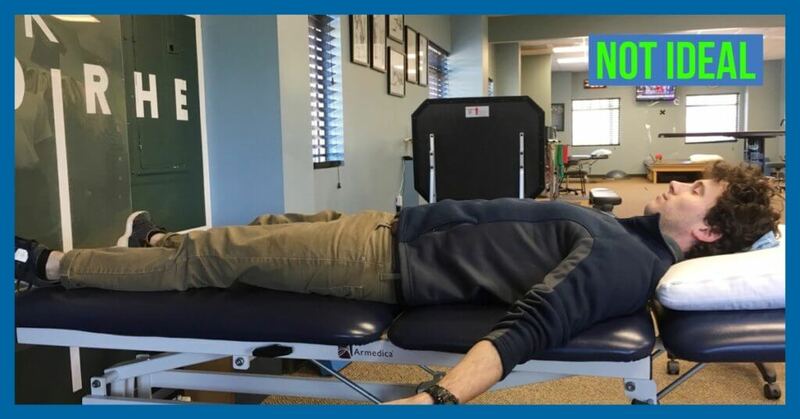 Forms of supine (back) sleeping are not as common as the side-lying position, but can be a safe alternative position with the right set up. Firstly, this position may not be the ideal position if you are a heavy snorer or have sleep apnea since laying on your back can cause your airway to become blocked or narrowed. 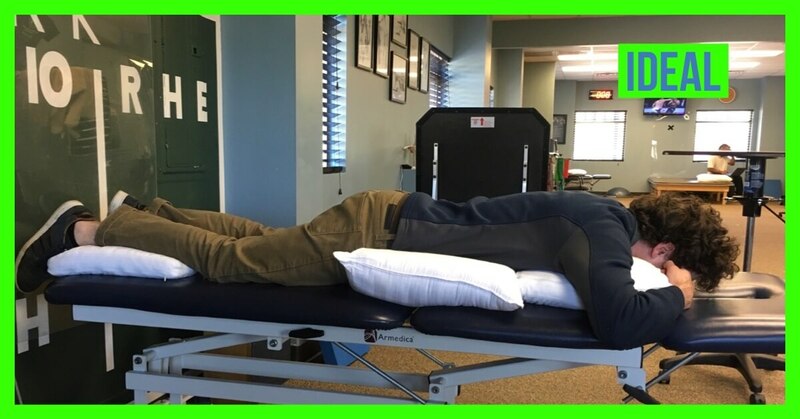 Sleeping flat on your back with a pillow under your head is NOT ideal because the lower back is in a compressed state and the neck is in a forward head position blocking the airway and straining the muscles on the back of the head/neck. It is said that supine sleeping can make your lower back sore or neck sore for the reasons listed above. 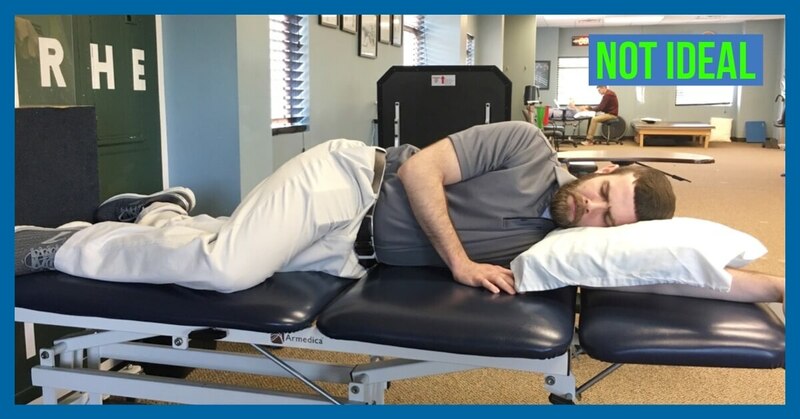 However, if you place a couple of pillows under your thighs to keep your pelvis in a more neutral/decompressed position and a towel roll under your neck instead of a pillow that pushes your head forward into a flexed position it can be a good choice for sleep. 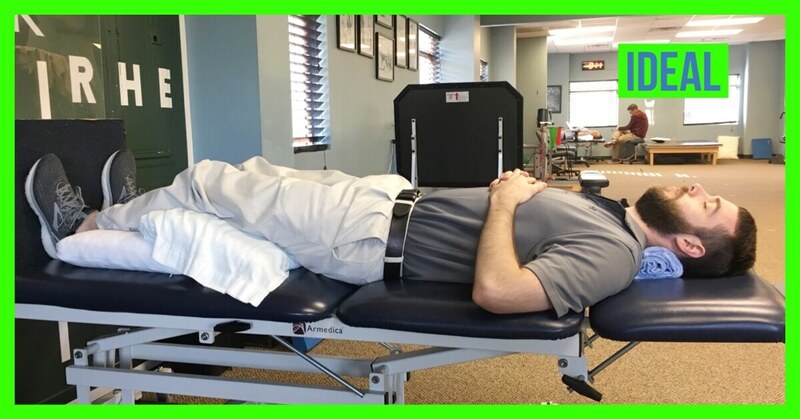 Prone or stomach sleeping variations are some of the more controversial sleep positions to choose from and are generally not popular or recommended to perform since the negatives outweigh the benefits. When sleeping on the stomach, one’s head is rotated to the right or left for long durations, placing strain on the neck. The neck & back are in an extended (chest up) position due to the forces of gravity, and breathing will be relatively restricted. If you are a stomach sleeper, there are better options to make this position less problematic. 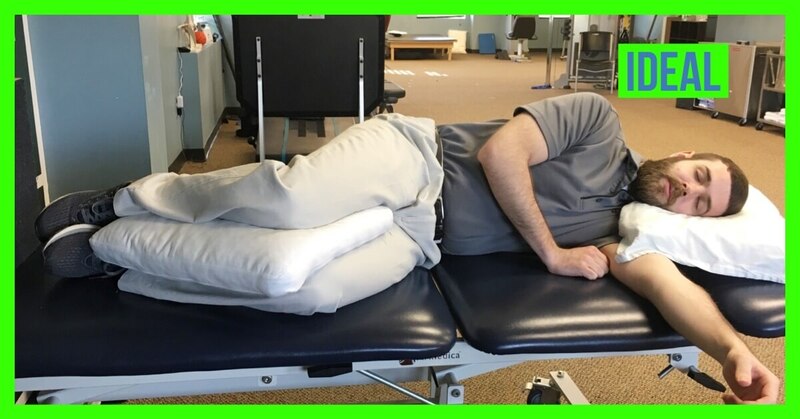 Place a pillow under your ankles and hips to keep the pelvis/spine more aligned and decompressed and try to keep your head facing forward rather than to the side (we know this may be hard). This is similar to the position you might would assume on a massage table. Long story short, prone sleeping is not ideal and can limit you from achieving a nice deep sleep. Even with the modifications we recommend, you can still wake with neck & back pain or stiffness.